THE NAIL SHED IS THE PERFECT DESTINATION FOR RELAXATION AND PAMPERING IN THE HEART OF THE CITY! Located in the heart of Bristol, on the vibrant Gloucester Road, the ethos behind The Nail Shed is to provide every client with the ultimate pampering experience that is tailored to each individual’s needs. THE NAIL SHED IS THE PERFECT DESTINATION FOR ALL OF YOUR BEAUTY NEEDS! 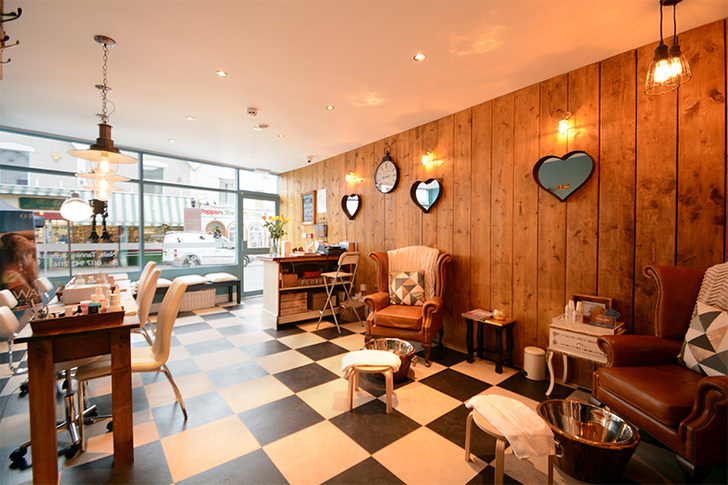 Located on the vibrant Gloucester Road, the ethos behind The Nail Shed is to provide every client with the ultimate pampering experience that is tailored to each individual’s needs. Since the salon opened it’s doors in the Spring of 2015, we have developed a fabulous loyal client base which continues to grow due to our friendly and professional team of beauty therapists who have a wealth of experience in all of the treatments we offer. We appreciate the fast pace lives of our clients and therefore we have made the salon a comfortable yet luxurious setting to allow everyone who walks through the door to completely relax and feel really special, from our Chesterfield pedicure armchairs, Champagne bath pedicure bowls and electric blankets for our facials……we think of everything! The products we use are what we consider to be the best professional products available. Wherever possible, we use organic products which have been ethically sourced yet also deliver outstanding results. We Are Looking Forward to Welcoming You Soon at The Nail Shed! We appreciate the fast pace lives of our clients and therefore we have made the salon a comfortable yet luxurious setting to allow everyone who walks through the door to completely relax and yet feel really special, from our Chesterfield pedicure armchairs, Champagne bath pedicure bowls and electric blankets for our facials……we think of everything!